Sanderson's legend grows even larger with a gold medal. Undefeated in college. Undefeated at the Olympics. 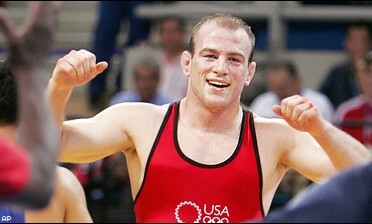 Years in the making, Cael Sanderson captured gold Saturday in the 185-pound class. Americans Stephen Abas and Jamill Kelly also medaled as both claimed silver. The wrestling mat always was the place for U.S. Olympian Daniel Cormier to burn off aggression and transform a not-always-easy life. U.S. women wrestlers are taking down antiquidated stereotypes about their sport. It has been a struggle for Sara McMann to overcome the loss of her brother, who inspired her to be a wrestler.